I was volunteering today at a robot competition for high-school age kids organized by FIRST, a non-profit to promote interest in science and engineering among high-school students. They organize a series of robotics tournaments, where teams of middle-school or high-school age students have to build a robot in 6 weeks to compete in a particular challenge. The teams work with adult mentors, who are typically real-life engineers or scientists. I was impressed by the quality of the work the students brought to today's NY regional competition at the Javits convention center. Most of the robots where highly functional and held up well through multiple rounds of competition. With the disappearance of the industrial middle-class in the US, education has become the single biggest factor in economic success (other than simply being born rich). The service economy consists of at one end of the spectrum of gold-color jobs which typically require advance college degrees and McJobs at the other end, but with very little possibilities to work you way up between the two. Kids at this age may not fully understand yet, how crucial education has become in their future lifes, but a lack of interest and engagement at this age is very hard to correct later. 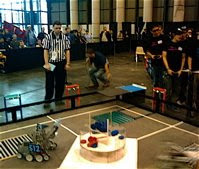 In the NY area, some of the teams participating in these robotics competitions come from schools with very low graduation rates, but some of the long-time mentors claim that the graduation rates among the members of the robotics teams is significantly (many 10s of percents) higher than the school average. Maybe there is a selection bias - i.e. kids who would participate in such a nerdy activity would have a higher chance or graduating anyway. But maybe getting to interact seriously with people from a technical profession gives some kids an idea that there are ways out of poverty other than aspiring to become a gangster, drug-dealer, rap-star or professional athlete (even if this path is unglamorous and petit-bourgeois...). But even if there is a small chance that exposing kids to the possibility that a career in technology might be an option for them to consider, then this seems like a pretty good use of our time.